Ready to use multilingual online shopping cart to help you build eCommerce websites: responsive front-end design, SEO friendly URLs, multiple payment options, voucher system, automatic shipping and tax fulfillment, client address book and more. 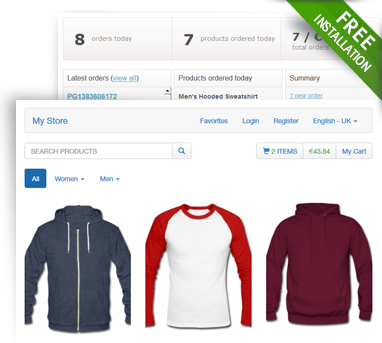 The STIVA Shopping Cart script is offered under two licensing options- user and developer. The developer license allows you to modify the shopping cart and install it on up to five domains. Comments: The Stiva Shopping cart (version 4) is a real blast! Great script with pretty much everything included. I love the responsive design and the interface. PHpjabbers know their job. The script is very easy but provides a lot. To be honest , the installation could be a little bit difficult, but once installed , it runs smmoth and nice. Generally, I am really happy with all the products, I have bought from PHPjabbers. Comments: Thank you Stivasoft for creating a very very good product.! Amazing support and script!